Corsicans are taking part in a series of ceremonies commemorating one of their greatest heroes, a freedom fighter, soldier and author by the name of Pasquale di Paoli. Many are worried that the story of how, under his leadership, the island struggled for independence - and how, after defeat by the French, he went into exile in London - may be forgotten. Unusually outside the tourist season, a snake of cars was trailing slowly into the hills of central Corsica. The sky was cloudless, and the peaks of the mountains snow-capped. The air was clean and fresh. Occasionally, a cow wandered across a hairpin bend - one of Corsica's happy, and uneconomic cows, a far cry from the industrial dairies of Italy, a few miles across the hazy Med, past the island of Elba. The cars caused a traffic jam in the mountain village of Morosaglia, and dignitaries and ordinary folk climbed out to mingle before an ancient, three-storey, stone house. 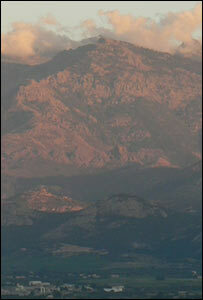 It was here that the father of the Corsican nation, and one of the greatest men in European history, was born. But we have come to mark his death - an event that occurred precisely 200 years ago, in London. Pasquale di Paoli was the Che Guevara of the 18th century - probably the greatest fighter for freedom of that century, an inspiration to democrats everywhere, a soldier who succeeded in liberating Corsica from the oppressive rule of the Genoese. But General Paoli was also an intellectual. Opposing taxation without representation, he wrote a Constitution for his fledgling nation that inspired the framers of the American Constitution - indeed, several towns in the US are named after Paoli. He was praised by pioneers of liberty like Voltaire, Rousseau and Hume. The young Scottish writer James Boswell was put on the map not by his biography of Dr Johnson, but by his travelogue and biography of Paoli, which became Europe's first international bestseller, rocketing Boswell to fame. Pasquale di Paoli's granite home overlooks a steep and staggeringly picturesque valley - the very essence of Romanticism. It's here that Paoli's remains were returned from London 100 years ago. I watched as the dignitaries - including the village mayor with his tricolour sash of the French Republic - stepped into a small mausoleum that's still hung with elaborate Victorian black-bead and silver lace wreaths. As cameras clacked, a local journalist leant towards me and whispered, "You see the two politicians in the middle - they've never been photographed together before!" This was interesting: it meant that the power of the Paoli legend is able, two centuries after his death, to unite the fragmented political factions of contemporary Corsica. It's still a turbulent island - sometimes described as having Europe's "third independence war" - after those of northern Ireland and the Spanish Basque country. Bombs go off constantly, and although the all-important tourist industry is rarely affected, nothing can paper over the continuing unrest. For, although Paoli successfully ejected the Genoese, his pioneering democracy was soon destroyed - by France. Once independent, Corsica is now a poor and often despised French province. And France's arrogant rule resulted, in the 1970s, in the rebirth of armed resistance. We moved to church for Mass, celebrated in part by the village priest, l'Abbé Mondoloni, one of Corsica's most outspoken supporters of independence. 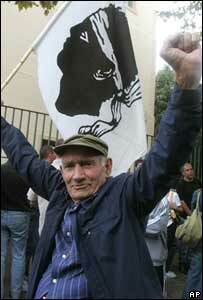 A charismatic firebrand, he told me after the mass with glittering eyes that France was "occupying" Corsica. White Corsican flags with their politically incorrect black moor's heads were waved, and songs intoned in Corsican. I observed that the official representative of the French state frigidly spoke to no-one. He may have been remembering that nine years back, one of his predecessors was assassinated on the anniversary of Paoli's death. I was the only Englishman present. I'd come to research a book about Paoli, but I was disappointed that no official representative of the UK had turned up. Corsican nationalists claim that Paoli is almost written out of official French history - but why have the British so forgotten our adopted son? For, after the French took Corsica, Paoli was welcomed in England as a hero, met the King, was granted a state pension, and entered the highest circles of English intellectual society. For two years in the 1790s, the curious Anglo-Corsican Kingdom, now almost forgotten, saw Paoli back in Corsica, supported by the British crown and navy - indeed, Nelson lost his eye fighting the French here. But the tide of geopolitics turned against Paoli, and the hero died, again in exile, in London, where he was commemorated - like one of our own national heroes - in Westminster Abbey. By then, at the end of his life, Pasquale di Paoli had become an admirer of Britain's pragmatic, unwritten democracy, monarchy and all. After a lunch combining champagne with peasant Corsican wild boar sausage, I chatted with the urbane Paul Giacobbi, one of Corsica's top politicians. "Yes, you British are pragmatic," Mr Giacobbi told me. "That's how you got peace in Northern Ireland. Ex-terrorists invited to form a regional government - shocking! No, we French are obsessed with rigid principles. But at the same time, we're insecure." "And that," he concluded, "is why Corsica is still in such a mess." From Our Own Correspondent was broadcast on Saturday 17 February, 2007 at 1130 GMT on BBC Radio 4. Please check the programme schedules for World Service transmission times.